Welcome back to the Cooking Academy! After winning a million dollars and starting your own restaurant, you are now writing your very own cookbook! And who better to help your research than your old professor Henri Formage and his friends! Learn interesting trivia about food while mastering all new skills and mini-games including Refrigerate, Seasoning, Find Food, and much more! Cook croissants, tapioca pudding, chicken & waffles, and many more new, exciting recipes! 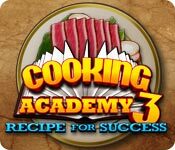 Get ready for a culinary adventure with Cooking Academy 3: Recipe for Success! Cooking Academy 3: Recipe for Success is rated 3.5 out of 5 by 57. Rated 5 out of 5 by crazyfool21 from it is a whole lot of fun it's by far the best cooking game i've played here on big fish games ever i will continue to play it it is awsome. Rated 5 out of 5 by Dylanandlukesmum from Takes Care of All My Criticisms of CA1! My main criticisms of the first CA were that it was too short, no retry button if you make a mistake, and being over-specific. This one addressed all of them! I am happy I bought this game, as well as it's 2 predecessors. Lots of fun! Rated 5 out of 5 by Chloe2008 from Love it! My 9 yr old Gdaughter kept asking me is there a CA3 yet? She was so excited when it came out. She loves it and so do I, we haven't finished it yet, but wooohooo so far. Rated 5 out of 5 by RevInFL from Crazy Cooking Continues I have been looking forward to the next phase of the Cooking Academy Series...this one did not disappoint. I love the improvements and the story line. Its a blast to play through first taking whatever star rating you get then start again and work for the perfect five stars. A great game! Rated 5 out of 5 by Chicago00034 from Cooking Academy 3 Absolutely loved it! If you have played the other 2 then you will DEFINITELY like this one! I actually couldnt wait for another one to come out and Im glad it finally has!! Rated 4 out of 5 by jennifermonk from A Good Game Not Bad It was entertaining. About the same as the oprevious ones. I didn't really see how really different it was from the others but still okay. Rated 4 out of 5 by pamalam10 from cooking academy3 it is fun and challengeing I enjoyed very much. Rated 4 out of 5 by born_princess from A little improvement in terms of scoring! The best part of the 3rd game was that scoring has been improved. In the previous two games, for even one small mistake the player lost straightaway 50 points...but in this one, the scoring is done on the basis of efficiency of good work done! However, this game was less categorized than the previous two! 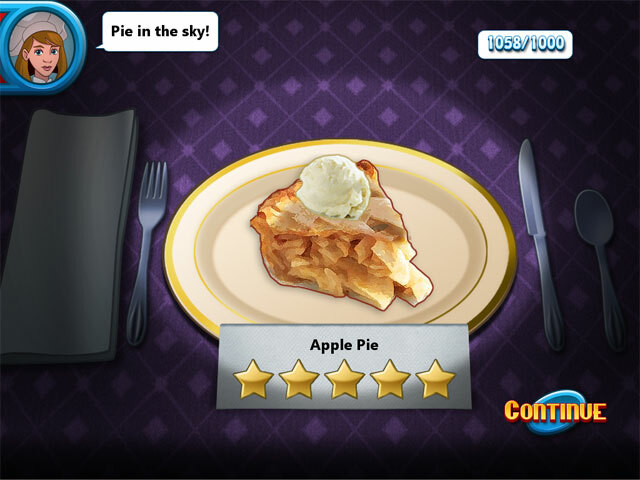 Nothing is comparable to Cooking Academy -2, the multicuisine version, its the best Cooking Academy game so far. Even the first game was well categorized into appetizer, breakfast, lunch, dinner, desserts...like proper menus! But in this one, all dishes are sort of mixed up! Overall, the fun factor has been increased in this game, and this one is a great success! Rated 4 out of 5 by Imberis from Fun, But More of the Same I liked this game enough to purchase it. If you've played a Cooking Academy game before, you know what it's like. If you haven't, it's like the Cooking Mama games, sort of. You make (virtual) dishes and try to do your best. There's chopping, peeling, egg cracking, stirring, etc. Some of it is fairly difficult to do. 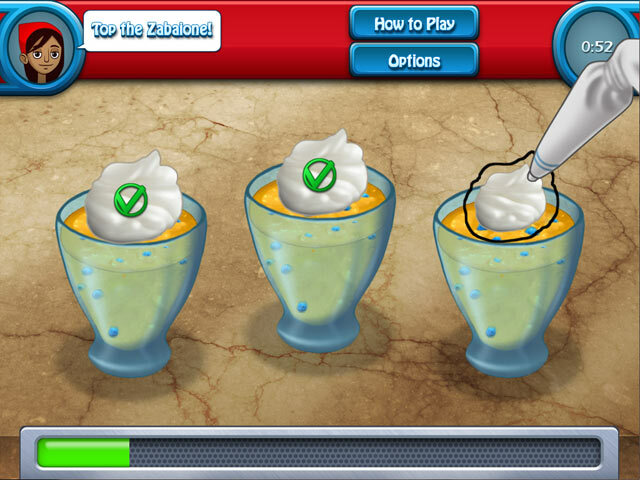 The game gives you these various steps to do, and then the steps combine to make a dish. At the end, you're given up to five stars based on how well you did. As you progress through the game and go to different sections with different kinds of food, it gets harder. However, a lot of the steps for some dishes are exactly the same, just with different ingredients (i.e., you peel potatoes for potato chips, and sweet potatoes for fries, or you play a ball-and-cup game for any peanut-related dishes). I will say that if you're not a fan of a lot of clicking/holding the mouse/dragging, this game is not for you. I can only play a little while before my hand starts to cramp up because there's so much to do. There's a lot of fast movement required, as well. The one drawback is if you've played one of these games, you've pretty much played them all. The game mechanics are all the same, and the basic concept is exactly the same. Rated 4 out of 5 by mammamia21099 from Good, but not great! I was a bit disappointed after having played the first two cooking academy's. This one, although it had the same type of cooking challenges, lacked the appealing storyline of the first two in the series. It seems to me that they just put this game out without any thought as to what would make the customer happy. It's a shame, because the first two were alot of fun. I do reccomend it tho. It isn't a bad game, it just doesn't live up to the first two in the series. Rated 4 out of 5 by Tiger2010 from A lot like the previous two, but also great fun! Having left the Cooking Academy to high acclaim last time, now you are writing your own cookery book. There are 8 levels with some 7 recipes to cook in each one, followed by the exams before you can move on to the next level. It's not difficult to achieve 5 stars in each level. This time, instead of cooking recipes according to Lunch/Dinner/Dessert, you are going by category: Sweet/Eggs/Chicken/Beef etc. 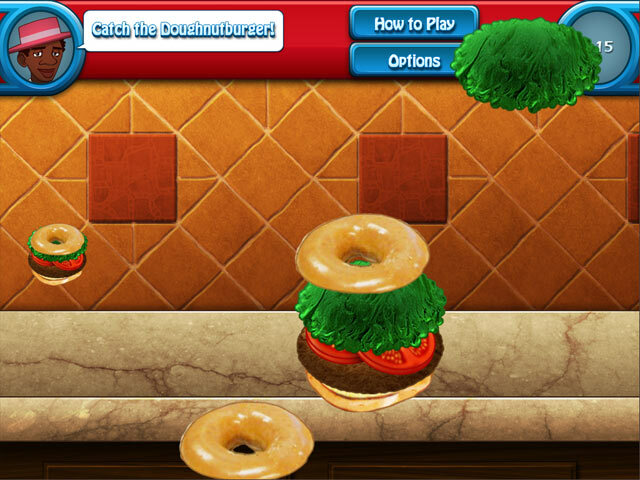 The gameplay is almost identical to the previous two Cooking Academies with, perhaps, two or three new skills. The graphics are the same too. It's a nice, safe game for those who love the series or love cooking TMs in general but there's not much difference. Having said that, it's a relaxing TM of its genre and a lot of fun, more especially with a Touch Screen for chopping up those ingredients. I enjoyed it and will play it again in future. Rated 3 out of 5 by bluesycat from Sad Follow-up to 1 and 2 I have to join an array of others who did not like this game. I loved the first two games in the series. They were fair simulations of actual cooking processes. This game is nothing but an exercise of mousing skills and hand eye coordination using a mouse. This is more like a game of pinball than a cooking simulation and I basically hated it (even though I love pinball.) I gave it three stars because you will have fun with this game if you like that kind of mouse dexterity game that this is. But I'm not recommending it! Rated 3 out of 5 by froggerjan17 from boring so you are back at the academy and you need the help of everyong there to write a cookbook. so you make different dishes, none that even remotely intersting, you chop, you slice, you boil etc. this game has potential. perhaps if it really taught you how to cook, how many real life ingredients you need, or how to prepared in proper order and cook. i just found this game down right a waste of time. Rated 3 out of 5 by falconr3 from Repetitive This game is overall fun to play, but gets repetitive, and is exactly the same except with different recipes. Additionally, it's almost the exact same as the 1st & 2nd game. After waiting almost 3 years, I'm highly disappointed! Rated 3 out of 5 by Cherche_Encore from 3rd Sequel....meh. At least with the other 2, you felt like you were playing a cooking game instead of a came about cooking. There is a whole entire level made up on cooking produce? Really? This one didn't hold up the standards of the other two. Rated 3 out of 5 by Kiwicouple from I should have played the demo. I bought this without playing the demo as I adored the first two.. I wish I hadn't. To many aspects of the game which were my least favourites in the first two played too big a part in this one.. Catching things..and memory games...not my type of thing at all. Although..everything I liked about the first two were still there, so I don't feel like I've wasted my money. I recommend playing the demo first. Rated 3 out of 5 by PMcOuntryGirl from Disappointed! I own both Cooking Academy 1 & 2. They were both fun and challenging. However, I'm glad I tried Cooking Academy 3 before I simply purchased it. The graphics were poor compared to the first two. The story line was basically non-existent. The recipes were super, super easy with a lot of repetition. I was not fond of the few changes they did make and doing the same thing over and over was incredibly boring. It was so easy, I finished the first "school" in 25 minutes flat with a nearly perfect score. I suggest you try before you buy. I found it too easy and too boring compared to the first two in this series. They had plenty of time between the second and third game to make a quality game. Maybe Cooking Mama on DSi spoiled me?